Compressors was something I never used in the past. Never felt the need. And frankly didn’t understand how I could use it for what I was playing. But recently, doing some research/playing in the style of Johnny Marr, I’ve finally understood the need, and began trying out a variety of compressors. To me compressors are fantastic, but when applied for certain styles. For instance, I brought up Johnny Marr. When he’s doing his interesting picking pattern/melody style you want that volume to be even through out the phrase. You want it to be even in relation to the loud strumming parts as well, and a compressor is fantastic for achieving this. Also, for leads it can help bring out certain phrases or runs depending on what’s happening in the solo. Originally, I always assumed compressors were all about chicken pickin, which is critical for that technique, but can be incredibly useful depending on the situation. Compressors are generally super simple to operate. Controls are usually volume and compression. Some offer some type of handler for attack and release of the compression. Some offer the threshold level of when the compression is applied. What is important with compression, is noise and tone. We want them to be quiet. We want them to be transparent. 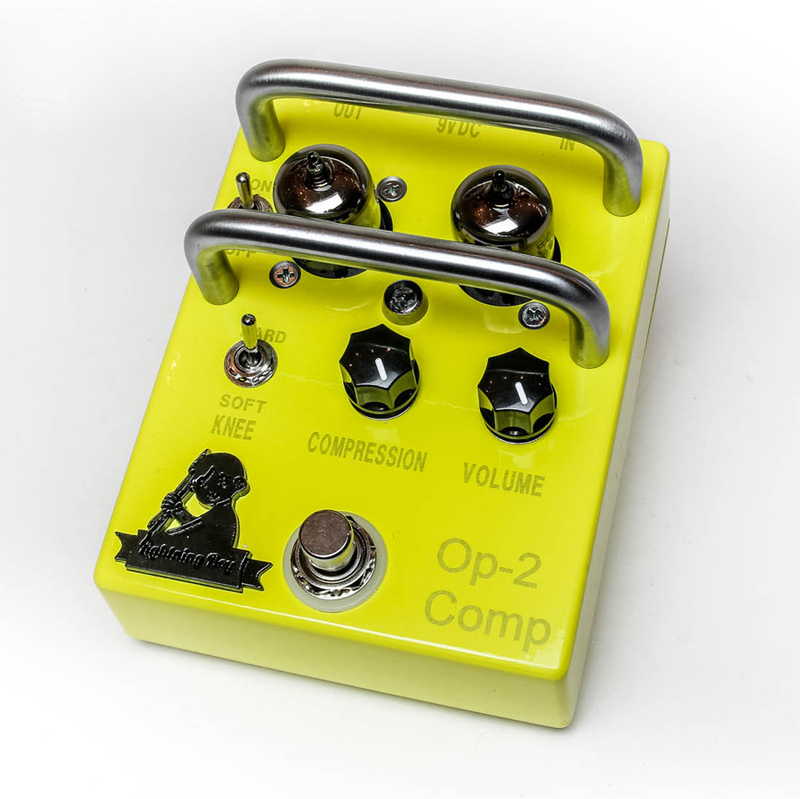 The great folks at Lightning Boy Audio wanted to send me their Lightning Boy Audio Op-2 Compressor which will be available after May 1st. I was stoked. When I pulled it out of the box, I was expecting a standard 2 knob comp, but immediately, I noticed the tubes. I love tubes in pedals. 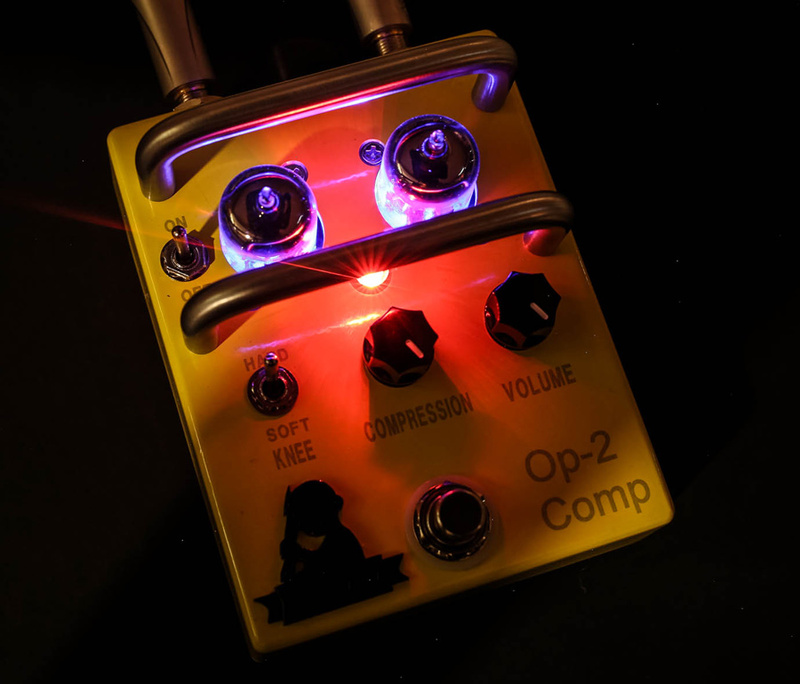 The Op-2 comes with a pair of NOS 12AU7 tubes which have been specifically chosen for low noise and high gain output. The unit comes with standard Compression and Volume controls. Additionally, there is a Soft Knee / Hard Knee toggle. The Soft/Hard knee controls how aggressive/light the compressor kicks in (attack). Since this is a tube unit, there is an on/off toggle that powers the tubes. You need to let it warm up, but only takes a few seconds. My thoughts instantly with the unit. It’s quiet. Re-al quiet. I was very impressed, especially with the tubes. My second thought, the pedal is very transparent. I find that some compressors will get a little ‘hissy’ and ‘brittle’ on the top when the compression is cranked, and this did a great job with those higher frequencies. The compression hits the sweet spot, it doesn’t get super compressed, but the right amount, which I appreciate. This is an optical compressor so uses a photo resistor to manage the compression. This is based on the Teletronix LA-2A rack compressor. Very cool. Vacuum tube powered optical compressor. Uses the exact same photo resistor as the famous studio compressor, the LA-2A, for that same, much loved, auto-release characteristic. Super transparent compression capable of being gentle and mild or highly controlled squish. Clean tone with a touch of vacuum tube warmth. Ultra low noise, even with the volume and compression at full. Wide and well balanced frequency response delivers studio quality in a pedal format. Ships with a pair of new-old-stock 12AU7 vacuum tubes installed. The tubes used in this pedal have been meticulously tested and selected for low noise and high gain. That’s just 17% of the NOS tubes we buy. Cream of the crop! Switch between soft & hard knee compression slopes. Soft is a smooth sounding attack, vs. hard, which is a snappy sounding attack. Hand-wired point to point. no printed circuit boards. Made with NOS paper in oil capacitors for superior tone. Designed by Mike Congilosi II. Assembled & hand-wired by Jon Clarke. Made in the USA! Op-2 Comp ships direct from LBA within 1 business day of payment. Again, the people at Lightning Boy Audio have something great happening. If you’re in the market for a great sounding compression pedal with some sweet tube warmth you might want to keep a close eye on this unit! It will be available for $399 directly from their website. Wow. Wish I could afford one. Looks good for both studio and live, but especially studio.